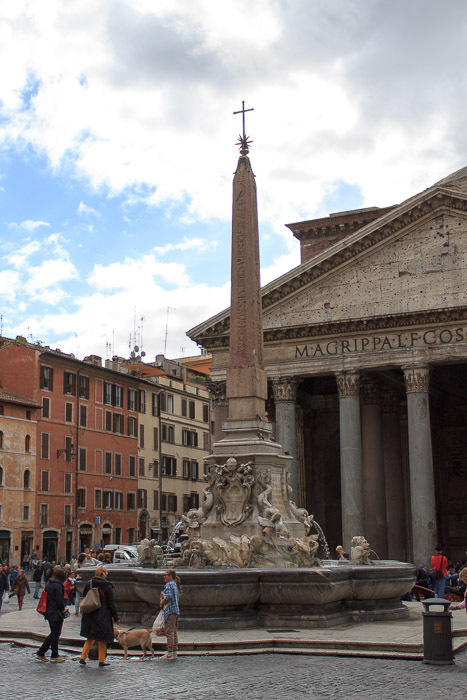 The Macuteo Obelisk is 20.8 feet tall (47.6 feet with base), covered in hieroglyphics, and now stands in front of the Pantheon. This obelisk was erected by Ramses II as one of a pair at the Temple of Ra in Heliopolis, the other being the now much shorter Mattei Obelisk. The Isaeum/Serapeum Campense covered a large area between the Pantheon and Via Flaminia (today Via del Corso) and it was embellished with several small-sized obelisks all coming from Egypt, probably during the first century AD by emperor Domitian. 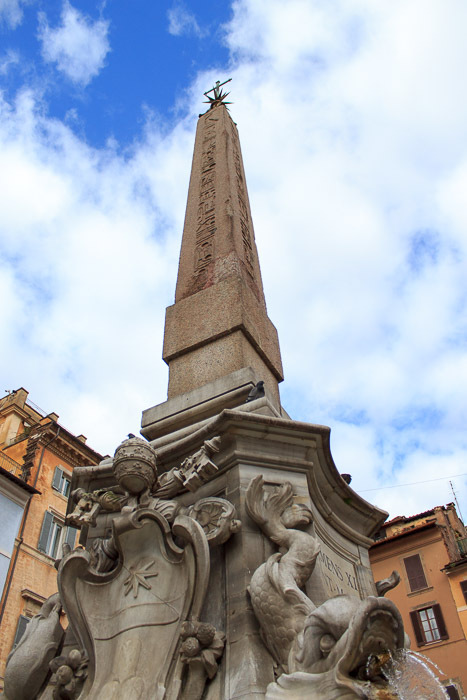 The Macuteo Obelisk was erected at the Temple of Isis, near the current-day Santa Maria sopra Minerva. It was subsequently found, in 1373, near San Macuto and referred to as Guglia di San Macuto in several descriptions of Rome, and was erected at that time east of Santa Maria in Aracoeli on the Capitoline Hill. In 1711 Pope Clement XI moved it to the center of the already existing Fountain of the Pantheon by Filippo Barigioni in front of the Pantheon. The top of the obelisk is decorated with the mountains and the star of Clement XI. See all Macuteo Obelisk photos.